PAUL JAY, SENIOR EDITOR, TRNN: Welcome to The Real News Network. I’m Paul Jay in Washington. In Pakistan, the effect of the massive flooding continues, with hundreds of thousands of people displaced. The war on the border between American and NATO troops and Taliban troops and their supporters rages on. The US offensive has begun around Kandahar in the south of Afghanistan. The battle is fierce, although very little reporting coming from the field in American news media. Now joining us to make sense of all of this is Muhammad Junaid. He’s a researcher doing his PhD in London, from Peshawar in Pakistan, very familiar with the situation in Afghanistan. Thanks for joining us, Muhammad. MUHAMMAD JUNAID, PHD STUDENT AND RESEARCHER: Thank you very much. JAY: In terms of the American offensive and what’s going on in Pakistan, tie these things together for us. JUNAID: Well, let us start, you know, with the immediate context of Afghanistan first, where the situation around Kandahar is getting hotter and the Zhari District is becoming the place where the next fight is going to happen. The reports are that the concentration of NATO and American forces is coming out of Marja and shifting towards the suburbs of Kandahar. This trend really replicates the Russian invasion. If you look at the chronology of things, as the things come to end for Russia, they concentrated on different spaces in big numbers, just trying and hoping to finish Taliban somewhere—or mujahideen somewhere, in that case. However, it is a guerrilla war, we should remember. They will pit a few hundred or maybe 1,000 guerrilla warriors against the Americans and NATOs, trying to do the maximum damage, and the rest of them will go into the mountains. However, in the media it will be reported very differently; it will be reported like a big victory. This seems to be happening in Afghanistan. Now, just across to Pakistan, and things are very different now. These are not two different wars now, because in the last one week, things have changed massively. NATO has continuously violated the Pakistani boundary. They have entered with helicopters and bombarded and sent missiles, killing Taliban, presumably, and killing many more people who nobody knows. But it became really bad when they hit a military checkpost on the border. Three Pakistani paramilitary troops were killed in that. Because of that, Pakistan has stopped the NATO supplies, and it is the fifth day that the NATO supplies are blocked within Pakistan. Now, in the last five days there have been three strikes on the NATO supplies. 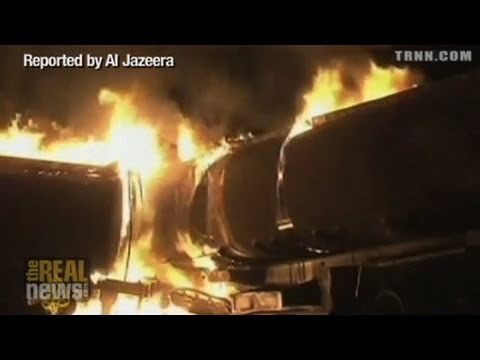 About 40 oil tankers have been burned down in three different incidents, and different drivers have also been killed who are carrying these supplies for NATO. The Pakistani foreign minister is in Brussels, and he has lodged a complaint. The news are that Pakistan is not going to accept any verbal apology. They need something written, and they need something more guaranteed. JAY: Let’s go back, first of all, to the historical piece. Many people have said the British failed, the Russians failed, the American-NATO venture’s bound to fail. But there were a couple of big differences, certainly, between the American situation and the Russian situation. First of all, there was a really nationalist, broad nationalist opposition to the Russian invasion. By the time the war was at its height, even the urban Afghans on the whole, as far as I understand it, were supporting the mujahideen, were opposed to the Russian invasion. In this situation, from what I understand, Afghan society’s more divided about the presence of the Americans and NATO, because a lot of the urban Afghans don’t want to see the Taliban back. The other thing that the Russians argue is that when you look at battle for battle, the Russians actually weren’t really losing, they claim. The Russian generals say the big thing that happened was the implosion of the Russian economy, that the Soviet leadership and the Russian economy just wouldn’t support this war anymore. They claim they actually—if they’d been allowed to stay, they could have won. Of course, we hear that from, I guess, every military in this kind of situation. Just compare this, the current situation, to the Russian situation. JUNAID: Let’s look at the, you know, similarities first. This notion of Afghan cities being at the loggerheads with Russians is actually misplaced, I can tell you. Most of the natives of Kabul migrated to Pakistan after 1992 when there was a civil war between mujahideen. So it means that at that time the cities were really kept intact by the Russians and by the local Pashtuns, who were communists. Many Pashtuns were communist at that time. There was a very strong military serving that communist regime. It was so strong that they even held to the communist government within Afghanistan more than three years after the Russia imploded, and Najibullah still kept there as a president for more than three years. This tells us a lot how strong the internal support was for the Russians. JAY: There was support for the Russians or for the Afghan communists in the cities. I guess that would lead to the conclusion, then, that the cities would be even more anti-Taliban. JUNAID: Yes, exactly. If you look at the city dwellers, they normally want their city life and their normal life returning to them. In the long run, nobody will support Americans to be there. That’s—you know, there is no difference on this. They will want, eventually, Americans to go out. Now, once America—. And what is the reason behind that? The reason is the current structure and the current parties which are holding the power in Afghanistan are actually made of warlords. They have got their own parameters, and they will want their own rule to be there. So why will oppose Taliban? Well, there is a simple reason: Taliban will not let them have their own parameters, not let them have their own small kingdoms. They will, you know, just—they will just go on. And, you know, maybe they will go on a killing spree again. So this is, you know, the main reason they are siding with America. It is not because of some human rights or some kind of development projects which can empower the poor of the area. The warlords will hate these things. They do not want the lower cadre of people to be empowered. But they want the enemies to be destroyed, and then for the Americans to leave. JAY: So in terms of the American campaign now, the Russians you could say in the urban centers had some support and still they had to leave anyway. The Americans—you hear in the Western press, and the American media particularly, is that this mission seems to be doomed. Most of the left and progressives around the world say this mission seems to be doomed. Do you think so? JUNAID: Well, you know, it depends on what we mean by "doomed". If we say that, you know, by "doomed", it is going to, you know, become a turmoil again as it was in 1992, well, it seems like it is going to become like that. There will be, you know, a lot of civil war, as it seems like. However, you know, America will not let that happen, I think. They are trying to, you know, reach some settlement right now, and they have approached Afghan Taliban. And there is a big change in the tone of Gulbuddin Hekmatyar and Mullah Omar, you know, in the recent one month. Gulbuddin Hekmatyar was interviewed by a Pakistani journalist, and his interview was recorded from an unknown place, and his tone was really different. He was looking for a broad-based government. Now, let’s shift to Mullah Omar, and his narrative has also changed a lot. He assured that there will be no attack from the land of Afghanistan and in foreign territories. So there is a change, which means that they can reach some kind of collective agreement. But the bigger problems in those collective agreements are a lot of influence for America, which America is really after, and Afghans are really against it. And then the regional powers, like Pakistan, China, Iran, and Russia, and to some extent India, do not want Americans to be here. JAY: In the next segment of our interview, let’s talk about the geopolitics of this. There’s all kinds of debate about why exactly is the United States in Afghanistan, what is the Afghan policy, and they seem to be caught between short-term crises and long-term strategic needs, meaning China. So in the next segment, let’s talk about the Afghan war and geopolitics in China. Please join us again on The Real News Network with Muhammad Junaid.